At UPrinting, you can do custom poster printing. From the home page, simply click the tab for Go to Large Format Products. We offer custom sizes for posters, banners, and canvas prints. Choose between digital inkjet printing and offset printing. Digital posters can be printed in any size up to 60"" x 100"", with a next-day turnaround. 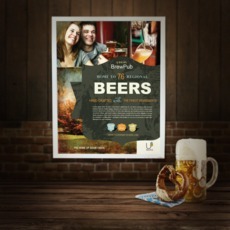 Our posters page will offer you ideas, specs, pricing, and reviews for digital poster printing. Choose a size, stock, and quantity for your posters. Semi Gloss and High-Gloss Paper Stocks are used for digital posters. More than 50 pieces of posters can be produced with our advanced offset presses. Custom sizes are available from 8.5"" x 11"" up to 27"" x 39"". We use quality and eco-friendly stocks for offset posters. 100 lb. Paper Gloss and 10 pt. Cardstock Gloss are 10 percent recycled. You can also click the tabs for offset posters and digital posters on the left side of the page. Make your own poster online with ease. Set your specs, upload your design, and ask for a free digital proof. Gets an instant poster printing quote using our online price calculator.